The time has come for a change. A fresh start. 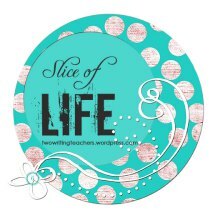 I started this blog so many years ago it’s become a hodge podge of things over the last years. But never fear! We have a new blog, with a new fresh perspective on this crazy world of education. We’re moving forward and moving on. It’s been fun, friends. We hope you join us over at our new home. 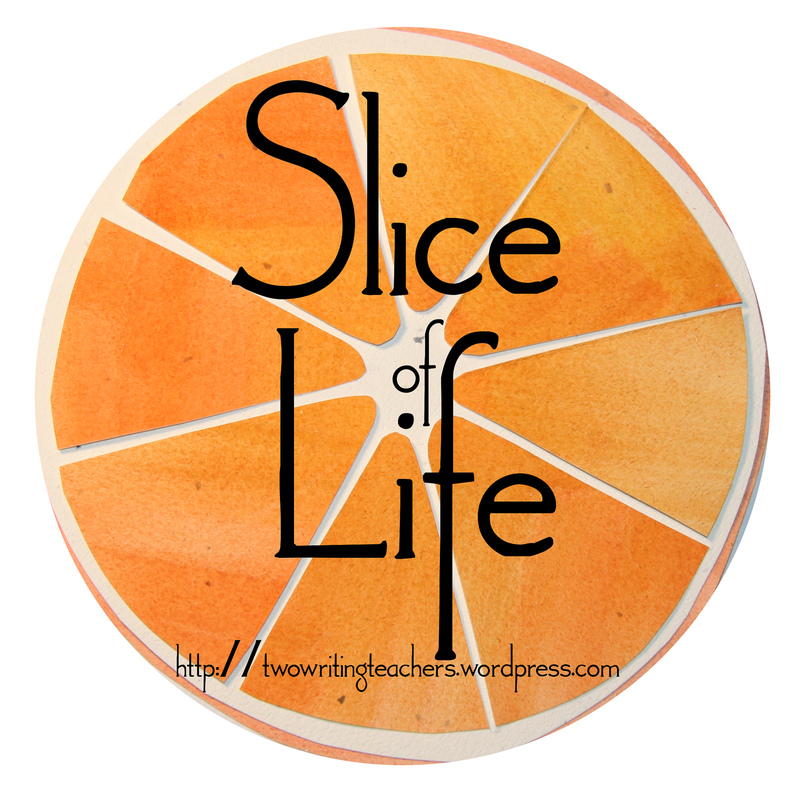 Join the Slice of Life movement at Two Writing Teachers. There are things I love about my job and other things…well, hate is a strong word. But I’ll get to that in a minute. Yesterday I had an extra spring in my step. Not even a polar plunge on the old temperature gauge could make me feel glum on a Monday morning. As I pulled my little one’s third pair of pants on in preparation for the voyage to daycare I mentally began checking items off my list. My pre NCTE14 list! That’s right, PREPARE FOR NCTE14! Attending conferences is one of my favorite things about teaching. Connecting with other educators, exploring new ideas, and long nights of great discussion are just the thing the doctor ordered during an early November cold snap. It’s a time of discovery, renewal, and sometimes it’s nice to just get away. That’s the love part of my post. Sadly, by 10:20 I had a dark cloud over my head. You see at 10:20 am today I saw the practice test for the PARCC exams for the first time. I know, I know I should have looked at them earlier. (Or maybe not at all.) It was just about the most depressing thing I’ve seen in a long time. I push my students to engage in deep thinking around great texts every day. They read, view, write, and more. I didn’t really think the Common Core would change that, and to be honest it really hasn’t changed it that much. There are certainly things that we look at more closely and I’ve used it as a opportunity to explore and freshen our learning up, but it’s not night and day. As my old Principle said, “good teaching is good teaching.” But these tests…these tests are something entirely different. I sat staring at the computer screen with my brow furrowing deeper and deeper by the minute as I looked at the test from a student’s view. The strange layout, the confusing questions, the multiple answers to questions, the dragging and dropping, the tiny box for an “essay,” and on and on. I felt hopeless, and I could see how many students will also feel hopeless, and then just start clicking. And even though this year the value added results won’t be tied to our performance (we still have NWEA for that) soon they will be and maybe my pay as well. I don’t know what that test measures but it’s not good teaching and there will be no added value to my classroom because of it. For now, I’ll push that dark cloud aside and head off to NCTE in hopes of connecting with like minded people and finding the renewal and energy that I so love about my profession. Perhaps together we can help forge a common path, one that honors our students and pushes them to be their best in an authentic and inspiring way. 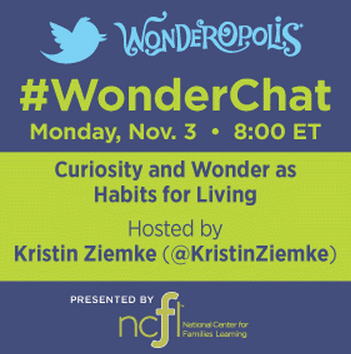 Join Kristin Ziemke as she guest hosts #WonderChat on Monday, November 3rd at 8:00 EST. This week’s topic will be Curiosity and Wonder as Habits for Living. 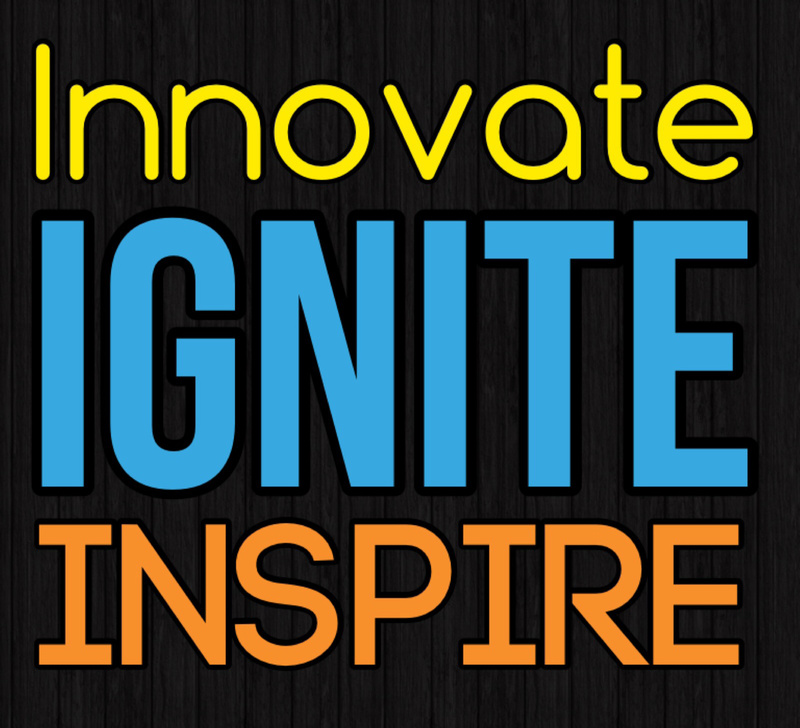 We’d love to hear your thoughts as we celebrate the power of WONDER and Wonderopolis. Join in! I know you read these as a kid! Flipping back and forth to make the story end in different ways. I used to love trying to read all the stories to make it end the way I thought it should. But can you do a book club with these types of books? That’s what we were wondering last year when we decided to order small text sets of the Interactive History You Choose series. Decide how your group will go about reading these books. Decide how your group will best capture their thinking. As I listened in I heard the students discussing the best way to go about trying to read and discuss. Several groups felt that they should just each choose their own path, then they could talk about it at their meeting. Other groups split into two sets of partners who would read together, then they would share with each other what they read. One group decided to sit and read as a group, and instead of jotting their thinking they would talk about the book as they read, then do some writing at the end of the book. Overall the students seemed eager at the prospect of something new and excited to be in charge of making so many decisions for themselves. Tomorrow we’ll meet to talk about the type of thinking that they found themselves doing during reading, which I anticipate will be a really interesting conversation based on my observations. “Gigi please get out of that drawer.” I was in the kitchen trying to cook dinner. Gigi was being a typical toddler and getting into everything that she possibly could get into. My frustration was starting to grow. I sighed and followed along behind her picking up the Tupperware containers that she had tossed all over my newly cleaned kitchen floor. As she opened yet another drawer and peered in to see what items she might grab I decided to entice her with a measuring cup and a whisk. She seemed satisfied for the moment and took the two items from me with a “dankoo.” I watched for a moment as she banged the whisk against the refrigerator, then put it into the cup and started stirring. “Where does she learn these things?” I wondered aloud. Of course the answer was clear. She had learned by watching me. She had learned by playing. I’m currently working our new book project and I’m immersed in research about play and learning. But I don’t really have to read articles and research papers to see the value. I see it everyday in my own home. As the mini-boss grows so does her desire to take on more adult like tasks. She watches adults carefully observing what they do and then attempts to take on the task, playing and experimenting with how things work. I use the swiffer, she uses the swiffer. I whisk the pancake batter, she whisks the pancake batter. I read pointing to the words, she “reads” and points to the pictures and words. And as she grows I notice what I knew all along. That the plastic toys and items intended for littles only go so far. She is just as happy, if not more so, with an empty box. A muffin tin. A dust pan. This is what real learning looks like. Time to explore and practice and do. Tasks that are authentic and intrinsically satisfying. I think we need a little more of this in our classrooms. As the summer heats up and the school supplies start making their way on to store shelves I think we all need to do some reflecting on the way we approach learning in our rooms. Our students don’t need fancy things created by companies to teach them. They need basic tools of the trade like books, markers, paper, and a creative technology tool. They need a good model to follow. They need real work and time to do it. They need to play. Student Ignite Presentations I loved the Ignite format for presentations and I’m dying to try it with my students. I can’t think of a better way to coach them to become stronger speakers and presenters. (And stick to a time limit!) No more reading off your notecards or slides kids! The Power of Play This theme emerged very clearly during the conference. From Kevin Carroll’s Keynote on The Red Ball to Gary Stager’s presentation on Invent to Learn. I created this Padlet of resources and things to write grants for so that I can get my kids playing, experimenting, and making! More Collaboration! I was so inspired by Julie Ramsay’s 6th graders and all of the ways they collaborate with other students around the world. http://ramsaysclass8ways.weebly.com After listening to them speak at their poster session I realized that I’ve only dipped my toe into the possibilities for my students. Digital Public Library of America I did not even know that this existed! BOOM! Best new resource ever. SAMR Model I know the SAMR model. I live the SAMR model. But after hearing Ruben Puentedura, the SAMR king himself, speak I realized that I need to put my knowledge of Pedagogy, Content, and Technology to work in order to get myself into the Modification and Redefinition areas more often! 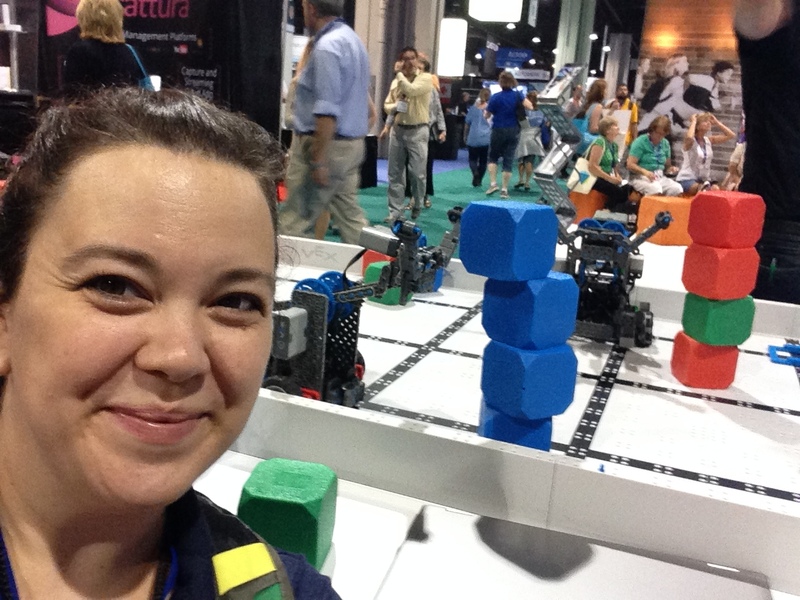 I’ve just finished my very first ISTE conference and wow am I spinning. So many things to learn, so many smart people to connect with, and so much fun to be had. Here are a few of my highlights from my conference! Presenting on Student Learning Networks with Kristin. It was so great to reorganize our ideas for this crowd and pull together some things we had been doing with our students. As we worked on this preso we both agreed that we want to do even more and I made it my mission to link up with some teachers who I could foster some classroom collaborations with. We’re still crowdsourcing ideas on ways to get our kids an authentic connected audience and their very own network to learn from. Share your ideas on our Padlet. Then there was the amazing Ignite speeches to launch the weekend. My favorite was Jennie Magiera talking about how PD is NOT a 4 letter word. It’s so true. We have to embrace professional development and make it our own. We deserve to be great learners as well. You can check out her blog here, but if you ever get the chance to see her in person do so! Between poster sessions I was lucky enough to see Ruben Puentedura talk for the first time. He is famous for his SAMR model and he is as brilliant as his beard is long. I became familiar with his model several years ago so I was thrilled to see him speak about the marriage of the SAMR model with the TCPK model in order to help teachers become innovate and effective technology users. You can see his slides from the presentation here. After standing in one of the many long lines (the longest was Starbucks) I was able to snag a seat in Gary Stager’s session on “Invent to Learn.” It was a call to arms to make learning authentic and play based. To not say no but to look for possibilities and opportunities and to not reserve hands on experimentation and building for only a small section of our students. You can check out his website here. These ideas were built upon during the Sunday morning Keynote by Kevin Carroll Katalyst, self named change agent and one of the most inspirational speakers I’ve ever seen! My summary of his presentation would not do it justice. Please take a few minutes and watch him speak. You can check out the ISTE playlist on Youtube to see other highlights and presentations from the conference. It’s well worth the learning. I still have so many notes and images to sift through, contacts to organize, and ideas to mull over. I will say that in all of the session I attended and conversations that I engaged in there were a few overarching themes. Lead the charge in both. Here I am triumphant with my 4 cube tower that I built with a robot at the @vex robotics booth. My Clementine from Katie Muhtaris on Vimeo. I recently made this stop motion video for the Slice of Life challenge and quite a few people were asking me how they might create one as well. Let me tell you it’s pretty easy! There are several good stop motion apps but the one I’m really liking right now is called Stop Motion Studio. It’s easiest if you have a stand for your ipad. Like the new Justand that I just got. If you don’t have a stand you’ll need to create something, probably using a stack of books would be easiest. Using the Stop Motion Studio app you simply capture a series of photographs that, when strung together, create a little movie. Stop Motion Studio is super easy to use and free. Although if you want some bells and whistles you’ll need to pay a bit for them. As far as the storytelling process I noticed that I did a lot of visualization in my mind so that I had a clear picture what I wanted to accomplish. I chunked it out. For example, I knew I’d start by pulling off the peel, so I had to think about how I wanted that to go before I started. Once that was done I worked section by section. You can almost see the “paragraphs” or “stanzas” in my story as I create different shapes and visuals. This process was so fun and creative. The app does allow for audio recording so I’d like to try something that includes words next! That’s the tweet that started it all. 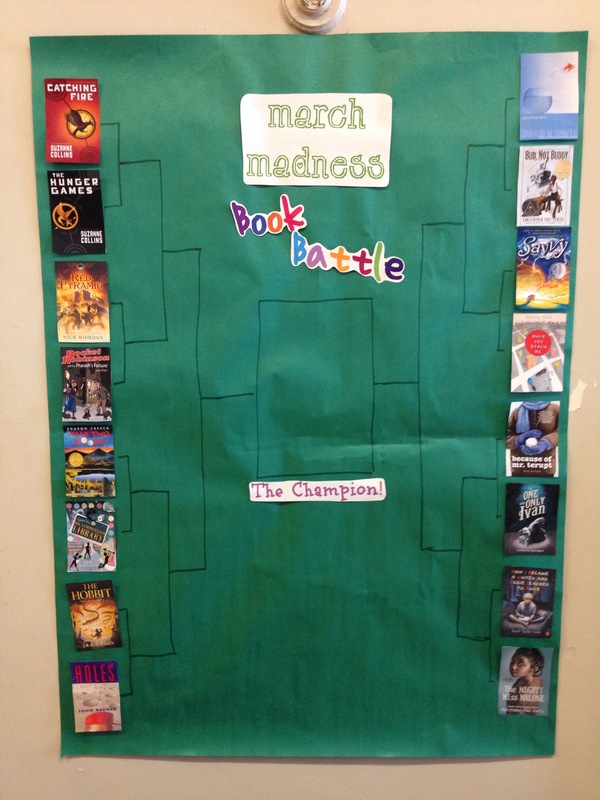 The Book Brackets for March. I thought it was a cool idea and didn’t think much more of it until my colleague Ben said that he was doing it. That we should all do it. So we are! And now I’m really excited. Let me tell you, it’s not an easy process. 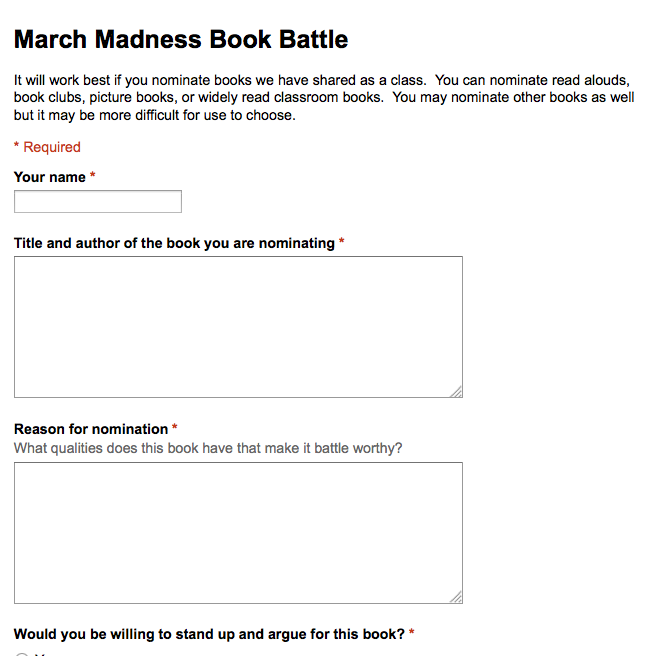 First I created a Google form where students could submit nominations for books. I had them nominate at least three books for the battle. Next I created a second Google form. This one listed each and every book that was nominated by students. 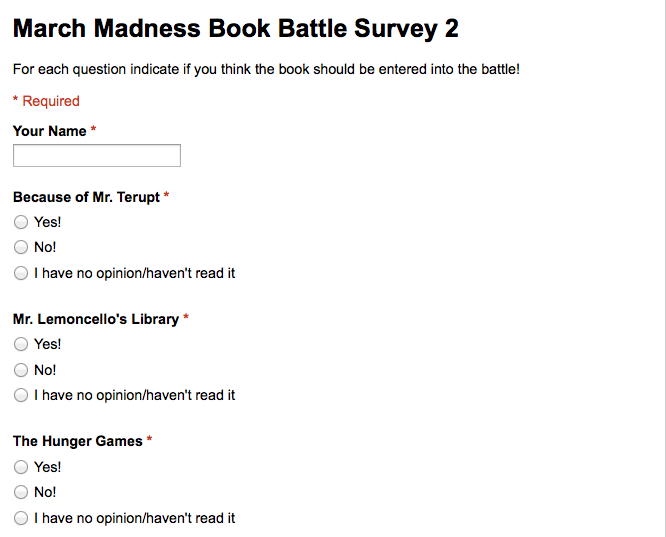 I had the class vote on each book and whether it should be included or not. 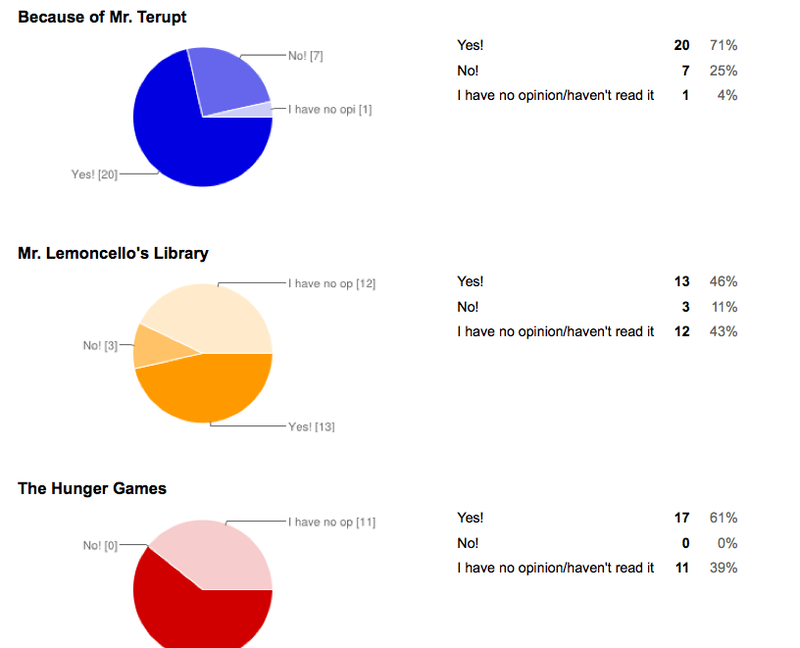 Lastly using the view summary of responses feature on Google forms I was able to see a pie chart of votes for each book and select the top 16 books with the most yes votes. From there I created my brackets! The class was so excited when they saw the poster. They were, of course, buzzing about the match-ups. (Which I had a really hard time doing!) Because I knew that not all of the book were shared reads for the class I decided to have the kids put their argumentative skills to good use. For each book a student volunteered to “speak for” the book. I’m giving them one minute to stand up and persuade their classmates to vote for that book. I can’t wait to see how this plays out this month. I’m writing this prequel to my slice after I’ve finished because I realize that this snippet of my day may make it sound like I’m some kind of strict directions Nazi that lives to stifle children’s innate creativity. I promise you I am not. There are so many years when I don’t give an example or leave things vague so that my students have room to create. If you come to my room you will see lots of creativity and personal zest. But there are times when kids need to follow the directions and this year I am struggling to help my students see the importance of this lesson. The following is a true story from the trenches of a very normal day. 4:30 am. A freshly brewed steaming cup of coffee in hand. I sit in the dark of my living room listening to the hum of the wine refrigerator (which is painfully empty right now) and click on my keys. I’m wondering this morning. Wondering and reflecting. Yesterday I asked the students to do something simple for me. At least I thought it was simple. We are in the middle of a unit on argumentative writing and based on prior writing I noticed that most of my students were struggling to write a simple, clear, and straightforward claim statement. Through my conferring and monitoring of my small Edmodo support groups I knew everyone in the class had decided on a position, had brainstormed their reasons, and was well into collecting evidence. So I asked them to post their claim statement to our Edmodo Writer’s Workshop group. Little did I know what strife this would cause me as a teacher. Cut to writing workshop. They smoosh in the door from technology class, a bit of excitement in the air. Writing notebooks come out. There is energy in the room, arguing is in the blood of every 5th grader. 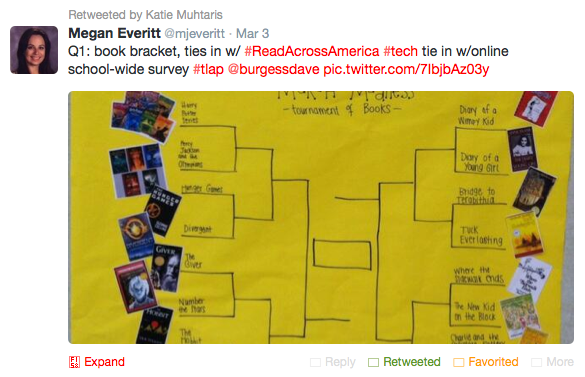 This format idea is not new to them but I think to myself…..self, I bet some students are still unsure. I pull our anchor chart about claim statements out and put it front and center. I draw an arrow. I let the students read the directions, and then I clarify. They have a large Edmodo group and a small one so I repeat the directions and remind them to post in the large group and to please write in a complete sentence. Just follow the format. “Is everyone clear on what we need to do today, in addition to our work collecting evidence?” Heads nod. Cool. So, my little writers get to work. Earnest work. Hard work. Many already have their statement ready to go so they decide to post it first thing before they dig back in to their research. I glance at the postings…uh oh. Not what I asked for. “Writers I need to catch you for a second. When you post your claim statement you need to include both your claim and your reasons. Not just one or the other. And please write in a complete sentence, please follow the format I asked for.” I feel a bit defeated. I’m not trying to stifle their creativity or mold them into a Pink Floyd-esque school of misery. I just want them to be able to write a clear, straightforward, simple sentence. I give it a few minutes and then I check again. uh…oh. So my wheels turn. Give them another example, I think. I go to the board and write an example next to the anchor chart. I believe that students should follow directions because it helps them be successful in school, teaches them to read carefully and closely, and prevents their teacher from going bananas. A few students giggle as I finish writing so they all look. I turn to see smiles around the room. Ok, I’ve got their attention. I whisper…Can you please make sure that you’ve written your claim statement just like this? By the end of class almost everyone had it right. Every student with an IEP had it right, every student with ADHD had it right. But still…..still…there were a good handful who needed a personal invitation to the instructions. When I checked with them they understood what I was asking for. They just didn’t do it. WHY!??!?!?!?!?!?!?!?!? After class I look at my student teacher Amy. “Why?” I asked. Why indeed and how to proceed. I had a great discussion with my student teacher the other day. Well, really it was more me talking through a line of thinking and her listening politely as she wondered “why am I stuck with this crazy woman?” I was reflecting on how poorly I felt my conferring with readers was going this year. I just couldn’t seem to get to enough kids! 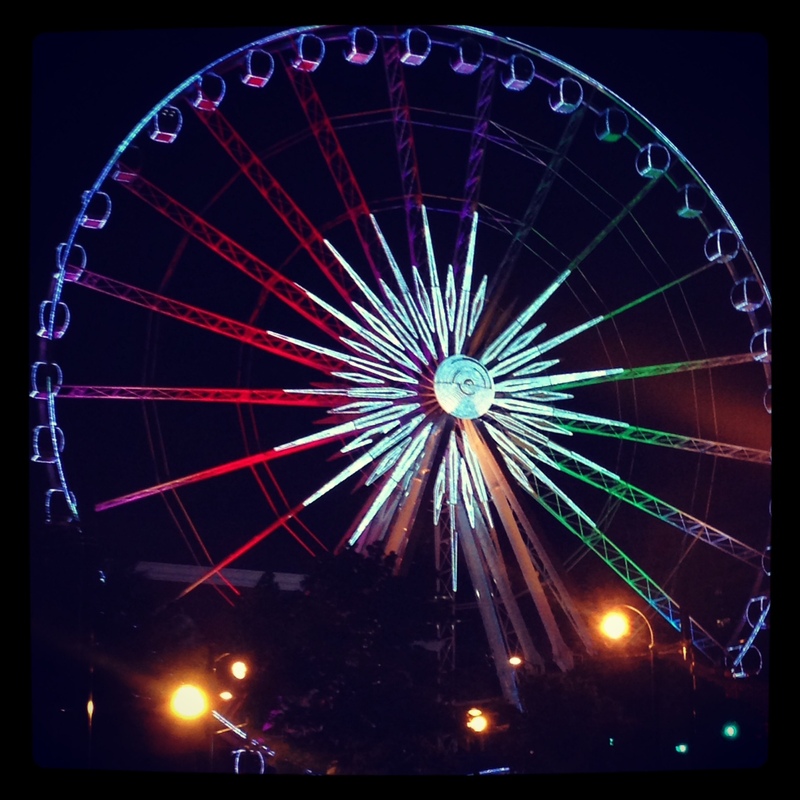 The amount of time between conferences was too long, and even though I have numerous ways that I connect with my readers (like their blogs and a daily check-in) I was really missing that consistent face to face contact. What to do? I realized that the main thing holding me back was paperwork. Long ago I learned about the importance of taking good conferring notes. I would dutifully fill out my little boxes with teaching points and observation notes, or when I was more ambitious I would do a full page reading interview. But when I sat down to look at these notes I realized a few things. 1) They were a bit superficial and subject to my snap judgements in the moment. 2) They were taking up valuable time that I could be talking to students. So I came up with a new plan. Use the Evernote notebooks that I created for each student at the beginning of the year to capture our conversations. Step 1: As I approach the student I create a new note in the student’s notebook and put the date as the title. I then snap a quick picture of their book or them reading with the cover clearly shown. Step 2: I ask the student “How’s your reading going?” and I hit the little record button and we chat. That’s it. We chat. Sometimes I find a great teaching point for the student and sometimes we just talk about the book. I don’t stress over it. I keep it quick and simple. Then I hit the stop button and move on. Step 3: At the end of my conferring I go to my clip board and cross off the names of all the kids I talked with that day. I use a typed up list that I’ve placed into a sheet protector. I just cross off the names with a dry erase marker and when I’m finished? Erase and repeat. Thanks Katherine Sokolowski (@katsok) for that great idea! I pressed my lips together and closed my eyes inhaling deeply through my nose. The student stopped mid sentence aware that he had somehow irked me. The opposite of his intention. I rubbed my hands together in a Mr. Miyagi style and then placed them on his shoulders and uttered the magic word. Goooooooozfraba. It’s a silly thing I say when I want to diffuse something in my class. Too loud? Gooooooozfraba. Too anxious? Gooooooooozfraba. Too serious or sad? Gooooooooozfraba. Find any student who has ever been in my class and say this magic word to them and watch the light of recognition on their face. Now in full disclosure I did not make up this word. It’s something that Jack Nicholson’s character says in the movie Anger Management. It’s a silly fake word but it stuck with me, and it works. Let’s focus on all the learning you’d like to do about the Ancient Greek city states. If you’re driven by the desire to know the grades will follow. He smiled and walked away both relieved and annoyed. It was not the answer he was looking for, but it was the one he needed. I had a revelation during NCTE this year, I forgot how to teach writing. I forgot that in order for students to learn they have to be able to see the writing in their own words, voices, and hearts. Sometimes in our haste to teach students we end up helping them too much. I realized that I had been helping too much. I had been giving too many comments, too much feedback, and in the process I somehow shifted the power from them back to me. Not good. It’s scary to put that on our students sometimes. To say to them “It’s your writing, you decide.” But there’s a very fine line between the spirited writing coach and fellow writer that I aspire to be and the heavy handed teacher that communicates there is only one “right” way to do things. It’s easy to slip sometimes because we have the benefit of years and years of experience. So I went back. I went back to showing how I savor mentor texts. I went back to asking more questions and listening. I went back to saying “It’s your writing, you decide.” And in going back I freed myself of the stress I’d been feeling. I didn’t need to go in and help them fix every little thing, I just needed to help them find the heart of what they were trying to say. We would get to the rest, we would get to as much as we could. We would do it on their terms. I stopped worrying about teaching writing and started thinking about teaching my writers. Teaching is the sort of profession that can wear you down. You don’t notice it happening. It might start with an extra cup of coffee and the next thing you know you’re crawling into bed at 8pm wondering what happened to your life. That’s why it’s so important for teachers to connect with each other around great ideas and renew our passion for our work. I had carefully scanned the program the night before looking for just the right sessions to fill my Saturday. I arrived an hour early and the room was already starting to fill. At a quarter till people were lined up down the hall and negotiating sharing chairs. At five till I gave up my coveted chair so a guy on crutches could come in and I situated myself on the floor, halfway under the presenter’s table. This room was packed with people ready to learn, ready to write. The session I most desperately wanted to see was headed by Penny Kittle whom I have just a teeny tiny teacher crush on. She’s just so real and she’s the type of person who makes you want to go back to school so that she will read your writing and comment on it. It was a session about writing and we were going to write. The strangers in that room took a journey together. Our presenters became our teachers, modeling their process, sharing their notebooks and strategies, and opening their hearts to take us to a deeply personal place. I was reminded of the absolute power of words. Words that change minds, words that express your hopes, dreams, and fears. In order to be fearless writers we must face fear head on. I sat on the floor, curled in a ball like one of my fifth grade students, and I wrote. I revised and I ultimately shared a very deeply personal poem about motherhood with two men whom I’ve never met before. Two strangers who became my writing safety net that day and who I may never see again. We shared our words and we will be forever linked. Here is the poem I wrote. How will I protect her? How will I prepare her? like her heartbeat next to mine. This year my class seems to have a competitive streak. It’s not all of the students, of course, but enough of them to significantly impact the community. It’s a fine line that I walk between motivating kids and teaching them that competition can really alienate students in our community and cause problems in friendships. So when I found an opportunity to put their competitive streak to good use I was thrilled. The crisp winter air rushed through the playground yesterday morning. Students huddled together, pulling hats down over their ears. I hurried to pick them up, grabbing my sweater close and wishing that I had remembered my jacket. The moment they saw me they exploded with excitement. “Mrs. Muhtaris, Mrs. Muhtaris look!” they shouted. Over half the class held up bags triumphantly. Grocery bags, target bags, backpacks. Fancy bags, cheap bags. Bags and bags and bags filled with food for the food drive. I don’t know if they will win their hot chocolate party. But I do know that every morning when they see what they accomplished as a group, when they see the cans stacked in neat row, the boxes of pasta and cereal organized with care there is a sense of pride. They are no longer competing with each other. They are competing together, as a team, as a community, and they’ve already won something bigger than a prize. What Do Kids Do When the Going Gets Tough? There are students in your classroom who often know how to do the math before you get to the lesson. You know which ones I’m talking about. They complete work in record time. They get the highest scores on all the tests. At conference time their parents might say “He’s bored,” “She’s not feeling challenge,” or “This curriculum is too easy.” It’s true. There are students who really excel at math and over the years we’ve wondered how we might best meet their needs. Enter the adaptive computerized tests like NWEA. You’d think these would help by giving you a list of things to work on. Not so much. Because these students are so advanced that they’ve successfully solved or, in some cases, guessed their way into math that they might not be developmentally ready for. But there is a skill that these students often lack. I watched it happen in my classroom today. Today was problem solving day. My teaching partner and I have made an effort to include more developed problem solving work in the classroom and we do these problems in pairs and small groups. I used a Problem of the Month from the Inside Mathematics website to build on the work we’d been doing with fractions. Three groups of my highest scorers got the more advanced problem. I wanted to challenge them. I wanted them to be able to go home and say “I was challenged in math today!” So what happened? Two groups worked diligently. They didn’t really know what to do at first so they started experimenting and talking looking for an access point. Those two groups eventually sat down together to share strategies and, even though they arrived at different answers, they talked about how the margin of error was small and the problem was challenging, so they thought the outcome was okay given the task. The third group imploded. Whining. Moaning. Frustration. I checked in with group three several times to see if I could coach them, give a hint, or just encourage. “This problem is soooooo hard,” they moaned. They glared at me. My error was clear. It seemed that even though these were the same students who loved to talk about how bored they were in math class, how easy the work was, how fast they got done, they didn’t really want that to change. They didn’t enjoy being challenged or being put in a place of not knowing. Math has been so easy for so long they didn’t know what to do when it wasn’t easy any more. Perseverance is a skill that every student needs. A skill that our “smartest” students may lack. If they’ve never been challenged or had to work hard will they know what to do when faced with a challenge? How will we ensure that every student gets the opportunity to work hard in our classroom?